in the form of colour. Light consists of the seven colour energies: Red, Orange, Yellow, Green, Blue, Indigo, and Violet. Each colour is connected to various areas of our body and will affect us differently emotionally, physically, and mentally. By learning how each colour influences us, we canæ effectively use colour to give us an extra boost of energy when we need it. If you wake up in the morning with little energy, or you need to prepare for a business meeting, this is where the power of colours can help. All you have to do is reflect on the type of day you have planned; choose the colour that will help you meet the demands of the day; and then absorb that particular colour. It's like fueling your system with the right kind of gas. This is a mentally-relaxing colour. Blue has a pacifying effect on the nervous system and brings great relaxation. Ideal for sleep problems, and hyper-active children. Connects us to holistic thought, and gives us wisdom and clarity enhancing communication and speech. Personality Traits: Inspirational leaders, kindly and just, humanitarians, self-sacrifing, visionary, creative, and strong mentally. 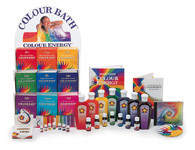 COPYRIGHT© 2007, COLOUR ENERGY CORPORATION. ALL RIGHTS RESERVED.